There seems to be a growing dissent against Cosplayers. Recently they've been blamed for the Economy, and over the weekend we saw former Micronauts artist Pat Broderick hit out at Cosplayers on Facebook. But what detractors don't get is that attacking Cosplay is attacking the very fans that love and admire their work. 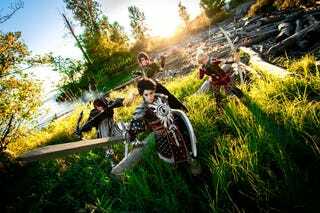 Header Image Credit: Dragon Age Inquisition Cosplay by Armed & Dangerous Cosplay, Emmabellish and Tarah-Rex Cosplay. Image taken by Bronson Le/Photosassin. It should be obvious to state this, but here at Toybox and io9, we love Cosplay. Not only is it great to see people take on our favourite characters and their designs - whether through faithful recreation or by adding their own twist to iconic imagery - but it's just as awesome to see the passion and dedication of fans who go through painstaking effort to craft such elaborate costumes over hours and hours of labour, and then have the confidence to show it all off when they're on the show floor surrounded by thousands of other fans, taking picture requests and navigating their way through crowds. This creativity and passion sits at the heart of what it means to be a fan - that overt, gleeful expression of love and interest in something, whether it's a TV show or a video game or a comic book character. We all have that passion, but it's cosplayers who personify it in its most blatant form. They're literally wearing it on their sleeves (and torsos and heads and... you get what I mean). That passion is what loving pop culture and things like comic books is all about, and to see it in action is part of what makes fandoms truly wonderful collectives. Image Credit: Brienne of Tarth Cosplay by Galacticat. Which is why it's so disheartening to hear creators like Broderick - and several of the other Con attendees who chimed in on his post - flat out deride Cosplayers and their passion as people who don't bring anything at all to Conventions. Part of it stems from that ever-awful 'fake geek' witch hunt, the ludicrous nature in some nerdy circles to try and one-up each other in their knowledge of pop cultural ephemera as if it's a competition, but it is also a sense of maliciousness masked with the faux concern that Cosplayers are somehow damaging the industry for 'real' fans'. The maliciousness in itself is an absurdity - as these Cosplayers have the same right to be at these cons as non-Cosplayers - but the 'concern' is just as bizarre. How on earth is Cosplay harming comics? Cosplayers are just as likely to purchase and consume content from these creators at conventions as anyone not dressing up, starters for ten. But at the same time, Cosplayers are also some of the biggest evangelists of fandom and of Pop Culture - they're visible, they're out there in person and in pictures across the internet inspiring other people, people in and out of these fandoms. They're symbolic of them, and of the passion of these fans. To deride them, to distance yourself from them, is to distance yourself from Fandom as a whole. And considering comics and popular culture is so dependent on that creator-fan relationship - it's also practically dooming yourself to failure. It's not the cosplayers who are damaging the industry, it's the people looking to discriminate against them. Image Credit: Death Star Dress by Lady Death Star. Image taken by Undiscovered Photography. Thankfully, the comics industry at large has come a long way since Broderick entered it in the 70's. Conventions have grown and expanded, and so has the fandom that visits them - and Cosplayers are part of that just as much as any other attendee. We should celebrate them, safeguard them when it's necessary, and remind people who think like Broderick that Cosplayers are the modern fanbase, and they're not going away any time soon.